← Many Faces of Community Health Conference: Register Now! One frequently cited observation in the world of cross-cultural care is that patients feel more comfortable dealing with providers who look like them. How to get there? Here’s an example from the Minneapolis StarTribune. 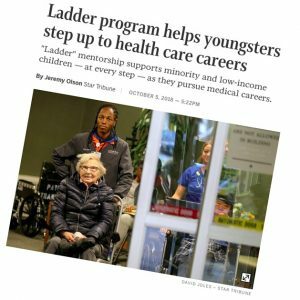 The article, Ladder program helps youngsters step up to health care careers, describes a north Minneapolis-based mentorship and training program aimed at turning more people of color into doctors, nurses and dentists. The Ladder program took off six years ago, when Dr. Renee Chrichlow of the University of Minnesota’s Broadway Family Medicine Clinic, founded the non-profit organization. Kids can start in the program at age nine, but they can hang on to mentorship opportunities throughout high school, college, and medical or nursing school.